This PDF 1.5 document has been generated by Microsoft® Office Publisher 2007, and has been sent on pdf-archive.com on 18/11/2012 at 19:03, from IP address 67.61.x.x. The current document download page has been viewed 559 times. 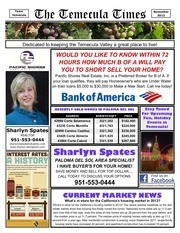 Dedicated to keeping the Temecula Valley a great place to live! YOU TO SHORT SELL YOUR HOME? on their loans $5,000 to $30,000 to Make a New Start. Call me today! I HAVE BUYER'S FOR YOUR HOME! What’s in store for the California’s housing market in 2013? housing starts have increased 43 percent, and apartment construction has increased 19 percent. in East Africa for great incentive prizes. &amp; Winery. Share your energy by raising funds for the Sun Strides Foundation. All runners will receive a free fundraising page with online registration. This file has been shared by a user of PDF Archive. Document ID: 00063422.